I’d like to run a little experiment. Let’s build a wall of examples of std::optional! 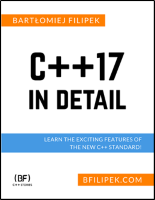 In the last three articles of my C++17 STL series I’ve been discussing how to use std::optional. I can talk and talk… or write and write… but I’m wondering how do you use this wrapper type? Later, I plan to compose a new blog post with all of the submissions. Send me a link to gist/coliru/compiler explorer… etc - with a short example of std::optional. This submission is one-time only so that I won’t add you to my email list automatically. However, if you’d like to stay updated about the results and future posts, then please subscribe. Ideally the max number of lines is 25 (not taking into account main() or the caller’s code). 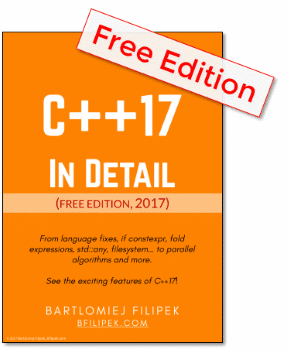 Feel free to submit the code if it’s longer, we’ll think how to make it more compact. Add description what the code does. The code should represent some “real-life” use. The code cannot, of course, violate any copyright rules. You can submit only one code sample. So probably your code will be one of those three above variations... but of course you might came up with something different. I have 2 x 25$ Amazon.com Gift Card. I’ll pick two random winners from all the submissions. Note: It’s an US gift card, so you’ll be able to use it on Amazon.com only. I’m waiting for your code!